Another week coming at you! If you missed any of the meal plans from January, be sure to go back and get more ideas from weeks one, two, three, four, and five! It is a pretty typical upcoming week around here after being away for vacation and now desperately craving the chance to get back in our routine - including with eating. Vacation is always a welcomed break and yet something I crave to settle in WELL after returning from. So the upcoming week is intended to set us up for some simple meals and new options, partially inspired by what items I had on hand when I did our fridge and pantry clean out upon returning home (like a big jar of sun-dried tomatoes and sweet potatoes about to sprout) with other easy items I have been craving more of lately (like breakfast tacos all day er'day) and chili. 1 ǁ Sunday Family Dinner: SUPER BOWL PARTY! Wondering how to pair one family meal to accommodate the whole family's taste preferences? Well, I share the complete "Love it, Like it, Learning it" menu each week with my subscribers. Click here to get the complete menu in your inbox! As always, feel free to send me your subscriber questions as well for the chance to have it featured below! At family meals that use the #likeitloveitlearningit approach, do you serve everything at once? I have one child that would eat only fruit if I let him, so we normally hold fruit back til after the meal. DIETITIAN MOM TIP: Typically, yes. You could serve fruit after/separate from a meal as a pre-planned “dessert” or bedtime snack if you already have preferred meals at the meal for that child. Otherwise, I would say yes, serve it all together. The reason for that is based on a Division of Responsibility (click here for more on what it is or click here for how to establish it in your home). The rationale for feeding this way is that you as the parent decide what, when, and where you offer the food and your child chooses if and how much they eat. The reason I answer your question with saying to offer it all at the same time is because the goal is to establish trust in the feeding relationship and to give your child a healthy sense of control over determining if/whether and how much they eat. If you “hold back” the food you know (and they know you know!) they want (being the love it food or fruit in this case), it can undermine trust and derail your child's sense of control in the feeding relationship. Ideally, you want your child to learn how to self-regulate the foods they eat. By "holding back" their preferred food, that is you controlling if/whether and how much they eat rather than empowering them with this life skill. As a mom of occasional fruit-only eaters myself, I know it can be SO hard to do this. I personally offer fruit almost every night for a healthy, "Love it" option that acts in place of dessert. Doing so also helps keep me from being tempted to do the whole, “if you eat XYZ, then you can have fruit for dessert (being that it becomes a reward).” I find it’s better for our feeding environment and establishing a Division of Responsibility if I set everything out together - even if that is the first and/or only item to go. Okay let's talk about bread. So many moms wonder what to do when their child refuses everything at the table besides the starchy item that in our (parent) head's is intended to be PART of the meal, not THE meal. Well, that's why I encourage investing in the actual foods your child will eat. I know there is a high-likelihood that on the night we have portabella mushroom burgers, my girls are not going to dig into that meatless patty and be mind blown (no offense, @SkinnyTaste). I know there is a pretty good chance they are going to go with a bun and cheese combo. So adventurous, right? It's not my end goal for what they "learn to like" but the reality is, the bread is often what kids love at this age and feeding stage. That's why I am going to look for one with more wholesome ingredients and nutritional density (those above on the left) than the dime a dozen, refined white bread hamburger rolls that are tempting to buy when they are fluffy and SO cost-effective (the image above on the right). Save those cheap, highly-processed buns for a big backyard barbecue when you need to care more about cost per person. For the occasional family burger night in though, invest in a product you feel more comfortable with (in the case your child only eats the bun). When standing in the bread aisle, compare what options you have. Focus less so on the nutrition facts label (although looking at the amount of dietary fiber can be a good indicator of how "whole grain" it is! ), and more on the ingredients list for what's actually in the burger buns. 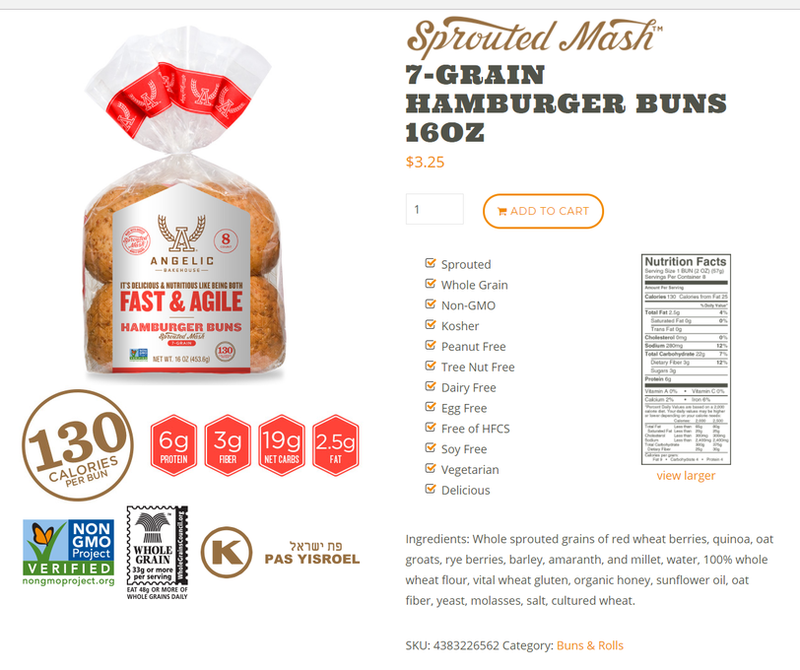 Aim for one that emphasizes mainly whole grains (using words like "whole" in the ingredients list), limits added sugar (like high fructose corn syrup), and has few to no preservatives. Our favorite buns are these by Angelic Bakehouse (shown above on the left). You can find out more about this product here. The items I pick each week are based on themes because it gives me a general guide for what to make for the week. But if I am being honest, we don't always do Tacos on Tuesday or whatever is meatless on Monday. That's because sometimes I need the crockpot item ready when we aren't going to be home until later on Mondays or something that reheats easily for my husband on Tuesdays. So be sure that what you plan, pick, and prep lines up with what works for YOU! 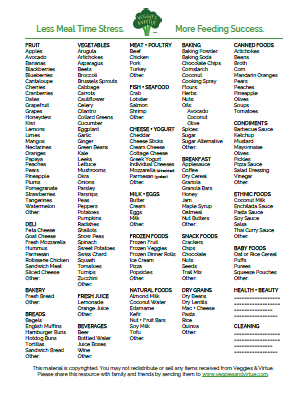 This will be the best thing you can do before jumping into what to prep each week and which items you can realistically get ready ahead of time without them spoiling before the night they're due to be dinner.